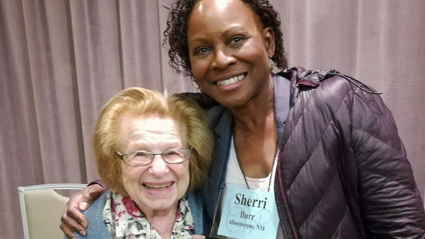 Professor Sherri Burr with legendary television personality Ruth Westheimer. Sherri Burr, Regents' Professor Emerita, attended Renaissance Weekend at the close of 2017, where she presented her research on "The Free Blacks of Virginia." According to its program, "Renaissance Weekends were founded in 1981 by Philip and Linda Lader as non-partisan retreats to build bridges across innovative leaders from diverse fields." The Charleston programs included subjects related to law, history, science, sports, entertainment and culture, among others. Burr was a panelist on three sessions, including "Generally Unseen--Black History We (and Relatively Fe Others) Know." Other panelists included Stanford professor Jim Campbell, the author of "Middle Passages." Burr received her invitation to Renaissance Weekend at the end of July 2017, as she was wrapping up nearly 30 years of teaching full-time at UNM Law School to become a full-time author. She says, "Having the opportunity to have dinner with people like the legendary television personality Ruth Westheimer was a hoot. She expressed interest in my book "Entertainment Law in a Nutshell." This was Burr's first Renaissance Weekend, where she also ran into classmates she hadn't seen since attending Mount Holyoke College and Yale Law School. "Because I was the only person from New Mexico among the 1,100 attendees listed in the program," she commented, "I felt an obligation to represent The Land of Enchantment. I plan to nominate others from our state so the program can expand its geographic diversity."